Not noticing a small patch of ice as he carried groceries on the way to his car, the 82-year-old man slipped and fell, shattering his pelvis. Forgetting that she had left her shoes in the darkened room, the 6-year-old woman tripped and fell over them, smashing her head on a table. 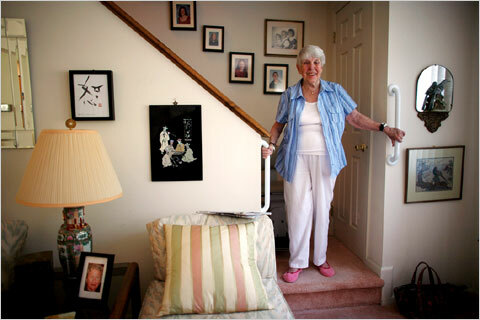 According to the Centers for Disease Control and Prevention, one out of three older adults falls each year. Falls are the leading cause of both fatal and non-fatal injuries, sending millions of elderly people to emergency rooms and hospitals. Whether it’s due to the icy conditions outside, a cluttered home, or simply a result of old age, falls need to be avoided at all costs. As many as 30 percent of the elderly people who fall suffer moderate to severe injuries, including hip fractures and head traumas. And, even for those who are not seriously hurt, a fall can cause emotional trauma by forcing them to limit their activities and impacting on their independence. This would include discussing with a physician or pharmacist their prescription and over-the-counter medications and supplements and reviewing the side effects and interactions that may increase your risk of falling. This should be done at least once a year, with eyeglasses updated to maximize their vision. This may involve going over any history you have of falling and the reasons for it, including dizziness, shortness of breath, lightheadedness, or joint pain. It may also include a discussion of specific things that can be done in the home to prevent falls – e.g. adding hand rails for the stairways, grab bars for the shower, a toilet seat with armrests, or extra lighting in certain areas of the home. Physical activity at any age can go a long way towards preventing falls. This includes walking, water workouts, tai chi, and weight bearing exercises. These exercises can help in improving strength, balance, coordination and flexibility. Any program, of course, first needs to be discussed with a physician. Putting an elderly person in a home strewn with obstacles is an accident waiting to happen. To make the home safe, remove boxes, newspapers, electrical cords and phone cords from walkways; secure loose rugs with double-faced tape, tracks or slip resistant backing (or remove the rugs altogether); repair any loosen wooden floor boards; apply non-skid floor wax; and use non-slip mats in the bathroom and shower. This includes wearing properly-fitting shoes with non-skid soles, avoiding high heels, tying shoe laces, replacing slippers that are too loose, and never walking in stocking feet. This means staying home rather than venturing outside when there are snowy or icy conditions. Should you fall, it’s important not to panic. You need to assess the situation and determine if you are hurt. Slide or crawl along the floor to the nearest couch or chair and try to get up. If you can’t, call for help. If you are alone, slowly crawl to the telephone and call 911 or relatives. Wearing a lifeline pendant around your neck at all times is a good way of preparing for the worse.